The Overberg Water delegation was led by the water board’s Chief Executive Officer, Phakamani Buthelezi, and comprised senior members of staff. Each division of Umgeni Water did presentations on their core functional areas, roles and responsibilities. Prior to these presentations, a presentation was done on the structure of Umgeni Water, mandate of the organisation and progress towards dis-establishment of Mhlathuze Water and incorporation of staff, assets and liabilities into Umgeni Water. A discussion was also held on the future supply area of Umgeni Water which will encompass the entire Province of KwaZulu-Natal. Umgeni Water’s bulk potable water tariff setting process and components of this tariff were also presented to the visiting delegation. Overberg Water representatives also shared information about their organisation, service area and number of customers. The possibility of signing a formal memorandum of understanding is now on the cards. A delegation from the South Sudan Ministry of Water Resources and Irrigation, comprising senior officials, visited Umgeni Water for an extensive fact-finding exercise intended to determine best practices they may be able to apply in the implementation of the Ministry’s mandate. They were accompanied by a representative of Niras, an international engineering consultancy based in Copenhagen, Denmark, which is an implementing agent for water projects in South Sudan. The 54th independent country on the African continent, South Sudan gained independence in 2011. It has a population of 12 million spread across 32 states. The vision of the Ministry of Water Resources and Irrigation is effective development and utilisation of water resources, and to improve the welfare and productivity of people in the South Sudan region. The Ministry’s mandate includes formulation and overseeing implementation of policies, guidelines, master plans and regulations for water resource development, conservation and management. Proceedings began with an introduction to Umgeni Water, its roles, functions and mandate. This presentation also contained details about the institutional and operational environments in which Umgeni Water conducts its business. 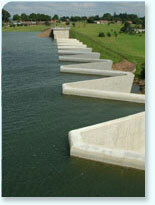 Information was also provided about infrastructure master planning and strategy and business planning at Umgeni Water. The delegation was pleased with the visit and indicated that presentations done would assist in honing some of the focus areas of the South Sudan Ministry of Water Resources and Irrigation.